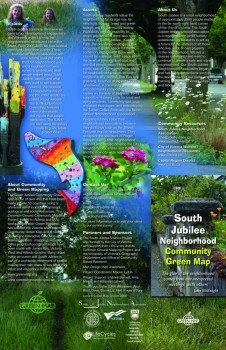 The South Jubilee Neighbourhood Green Map is Printed! The Project began with funding from the City of Victoria in 2006. 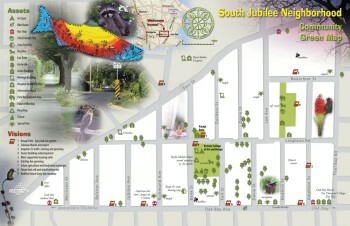 The South Jubilee Neighbourhood Association (SJNA) is vibrant and strong. Its mission is to improve and enhance the liveability, economic and social health of the neighbourhood. 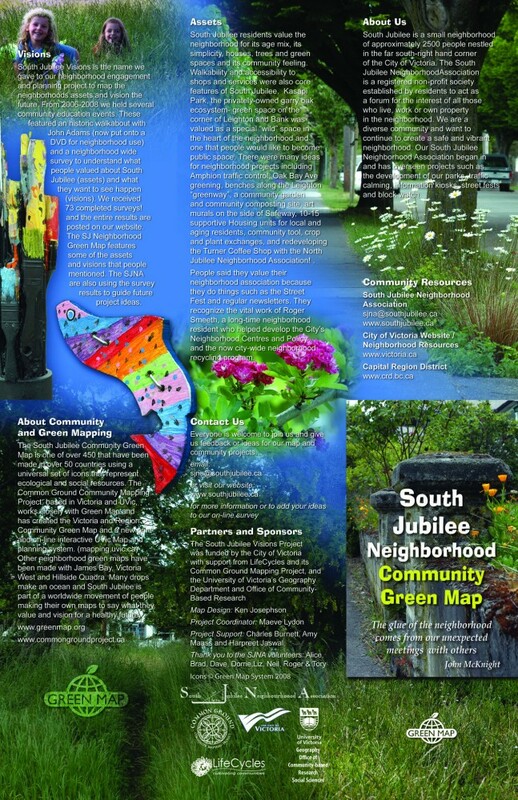 Over the past fifteen years the SJNA has created a strong foundation through many environmental and social projects with some special features including a Garry Oak meadow, kiosk bulletin boards, murals, traffic calming, park development, a regular newsletter and block captains on every street. This Visions and Mapping Project is designed to revisit the South Jubilee community vision last outlined in 1992 (see Appendix One – “A Vision for South Jubilee Neighbourhood”) and incorporated to some extent in the 1996 Jubilee Neighbourhood plan. The SJNA believes that the process of mapping, outreach and plan/map development will: provide the foundation for neighbourhood-based plans for the next several years; strengthen a positive, working relationship with businesses; and be a win-win process with the City to support their city and neighbourhood planning, particularly in the areas of citizen participation and Greenways development. Interview all businesses re: future of Oak Bay Ave.